Start off your visit on the 31st (Fri): take in nature's colorful creations at Lan Su Chinese Garden and then look for gifts at Powell's City of Books. 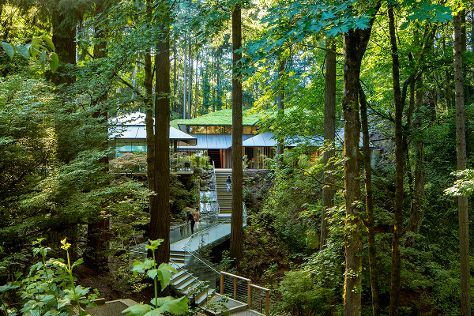 On the 1st (Sat), you'll have a packed day of sightseeing: examine the collection at Oregon Museum of Science and Industry, then stroll through Oregon Zoo, then take in nature's colorful creations at International Rose Test Garden, and finally take in nature's colorful creations at Portland Japanese Garden. To see photos, traveler tips, maps, and other tourist information, read our Portland travel itinerary planner. Orlando to Portland is an approximately 8.5-hour flight. You can also drive; or do a combination of bus and train. Due to the time zone difference, you'll gain 3 hours traveling from Orlando to Portland. In May, Portland is a bit cooler than Orlando - with highs of 70°F and lows of 51°F. Wrap up your sightseeing by early afternoon on the 2nd (Sun) to allow time for travel to Lancaster. Lancaster is a city in Fairfield County, Ohio, United States. Kick off your visit on the 3rd (Mon): don't miss a visit to Rockhouse, identify plant and animal life at Conkles Hollow State Nature Preserve, and then take a memorable tour with Tours. Find out how to plan Lancaster trip without stress by asking Inspirock to help create an itinerary. Explore your travel options from Portland to Lancaster with the Route module. The time zone changes from Pacific Standard Time to Eastern Standard Time, which is usually a 3 hour difference. June in Lancaster sees daily highs of 82°F and lows of 61°F at night. You'll set off for home on the 4th (Tue).